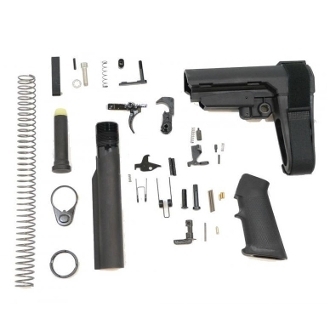 This lower build kit comes with everything to make your stripped lower a complete lower. Includes a lower parts kit, mil spec buffer tub kit, and the SB Tactical SBA3 pistol brace. The sba3 brace is the most popular adjustable pistol brace on the market today. LENGTH: 6.1", 6.75", 7.5", 8.25", 9.5"